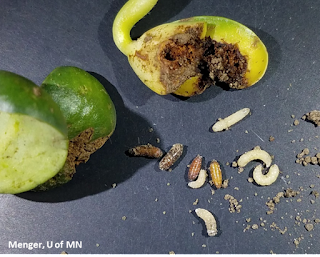 Some fields in Minnesota have experienced significant stand loss caused by seed corn maggot. In a field in Dakota County (southeast Minnesota), research plots planted in the last week of May with untreated soybean seed incurred greater than 90% stand loss. This field had none of the typical risk factors for infestation by seedcorn maggot, except for likely planting during a period of fly activity. In addition, a report was received of a central Minnesota soybean field with seedcorn maggot injury. Portions of the neighboring fields had some seedcorn maggot injury as well. It turns out, that this field had been planted to sweet corn in 2017, but the field was passed and not harvested. The resulting decaying sweet corn may have attracted egg-laying adults last fall and subsequently supported a very large population of overwintering pupae. Soybean planting into the still decaying sweet corn this spring was likely timed well with fly emergence and egg laying. As you perform early season scouting of your fields, keep seedcorn maggot in mind if you start to observe issues with plant emergence. Below, we provide an overview of the pest's identification, biology and management. Injured cotyledons from an infested soybean field, and seedcorn maggot larvae and pupae collected from injured plants and soil near the injured plants. Seedcorn maggots are small (1/4-inch long), white maggots that live in the soil feeding on decaying organic matter and germinating seeds. The maggots develop into brown, cylindrical pupae about ¼-inch long in the soil, which then develop into grayish-brown colored flies about 1/5–inch long. The adult flies can be easily mistaken for a small houseflies. These insects develop quickly through several generations per year. The maggots feed on seed and germinating plant tissues. Maggots can destroy seed, which results in stand loss. Maggots feeding on germinating plant tissues can tunnel in and scar the surface of cotyledons. If they feed on and destroy the growing point of the plants, the plants may die or become "Y–plants." Such Y-plants are caused when branching develops at surviving nodes and may result in further yield loss through competition with neighboring healthy plants. Furthermore, feeding by seedcorn maggot can open the plant to secondary infection by fungi, which can cause damping off. As you are scouting, it may be difficult to distinguish some plant diseases from some of the above symptoms. Rescue treatments are not available for seedcorn maggot infestations. If significant stand loss is incurred, replanting may be required. However, the decision to replant should be considered carefully. Information is available to guide replant decisions in soybean (https://extension.umn.edu/soybean-planting/soybean-damage-and-replanting). Furthermore, cool and wet soils that delay emergence may increase time that plants are susceptible to attack by seedcorn maggot and other soil pests. Avoid planting at least 2 weeks after fresh organic materials are incorporated into soil. Degree-day models can guide decisions about adjusting planting date to avoid periods with high larval abundance. Seedcorn maggot development is estimated using a base temperature of 39°F for degree-day calculation. Planting should be avoided during peak fly emergence, which occurs for the first three generations when 354, 1080, and 1800 degree-days have accumulated, respectively. Preventative seed-applied or in-furrow insecticides may be considered for fields with high risk for infestation by seedcorn maggot (see above for risk factors). Be sure to follow instructions on insecticide labels.